Welcome to Deakins Suzuki Strings! 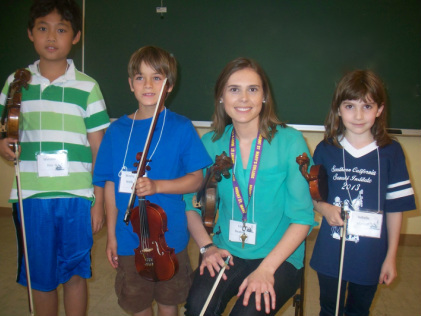 Suzuki violin instruction provides a fun and exciting way to experience music as a young child! Here you will find everything you need to know as a beginning Suzuki violin parent. ​Watch Lisa on Fox24 News Now to find out! "Lisa inspired my daughter to take true ownership of her music by masterfully balancing responsiveness with direction. I was amazed at not only her broad knowledge of many instruments and topics, but also at her sensitive, perceptive, and principled teaching style." Deakins Suzuki Strings was featured in the Daniel Island News! Students together after a great week at the Southern California Suzuki Institute! ​"If children hear fine music from the day of their birth and learn to play it, they develop sensitivity, discipline, and endurance. They get a beautiful heart."